Here we are in the middle of the World Series and while I’m loving it, I’m also gluttonous. Always looking for the next score. Well, the next score is affectionately known as Prospect Season, where people like me rank the best prospect by team and/or by position. But the fix AFTER THAT is college baseball. The season kicks off in just 4 short months and I’m excited and you should be too. If you’re a prospect fan, you probably follow the draft. If you follow the draft, you know that some kids choose to go to school rather turning pro. Many of these names below will be first round picks in 2013, while others will fizzle out. Either way, they’re going to give me plenty of box score entertainment over the next few seasons and we’ll get to see a few of them in Omaha. Below you’ll find the top 31 freshmen in college baseball. Why 31? Don’t ask so many questions. This is not my list, but simply a formula of the top 200 2010 draft prospects as determined by Baseball America minus college players minus prep players that turned pro. Karsten Whitson – RHP – Florida. 1st Round (9th Overall) – SD – #15. Dylan Covey – RHP – San Diego. 1st Round (15th Overall) – MIL – #18. Austin Wilson – OF – Stanford. 12th Round – STL – #27. Ryne Stanek – RHP – Arkansas. 3rd Round – SEA – #42. Kevin Gausman – RHP – LSU. 6th Round – LAD – #43. A.J. Vanegas – RHP – Stanford. 7th Round – SD – #46. Kris Bryant – 3B/1B – San Diego. 17th Round – TOR – #53. DeAndre Smelter – RHP/OF – Georgia Tech. 14th Round – MIN – #72. Dominic Ficociello – 3B – Arkansas. 23rd Round – DET – #77. Scott Frazier – RHP – Pepperdine. 5th Round – PHI – #85. Eric Jaffe – RHP/1B – California. 19th Round – BOS – #91. Randy LaBlanc – RHP – Tulane. 16th Round – FLA – #92. Stefan Sabol – C/OF – Oregon. 17th Round – ATL – #95. Adam Duke – RHP – Oregon State. 16th Round – BOS – #117. John Simms – RHP – Rice. 39th Round – WAS – #118. Adam Plutko – RHP – UCLA. 6th Round – HOU – #131. Zach Weiss – RHP – UCLA. 10th Round – PIT – #132. Brian Ragira – OF/IF – Stanford. 30th Round – TEX – #139. Michael Lorenzen – OF – Cal State Fullerton. 7th Round – TB – #140. Jimmy Hodgskin – LHP – Troy. 43rd Round – PHI – #142. Daniel Gibson – LHP – Florida. 26th Round – MIL – #148. Austin Kubitza – RHP – Rice. 7th Round – PIT – #153. Tyler Kuresa – 1B – Oregon. 11th Round – MIN – #163. Zach Alvord – SS/2B – Auburn. 18th Round – ATL – #165. Sean Dwyer – 1B – Florida Gulf Coast. 15th Round – #167. Jacoby Jones – 3B – LSU. 19th Round – HOU – #166. Matt Roberts – C – UNC. 38th Round – ARI – #169. 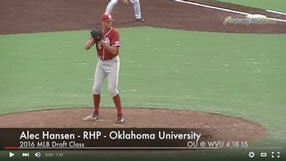 Jason Hursh – RHP – Oklahoma State. 6th Round – PIT – #173. Krey Bratsen – OF – Texas A&M. 45th Round – OAK – #175. Kevin Jiomek – LHP – Vanderbilt. 13th Round – ARI – #178. Andrew Knapp – C – California. 42nd Round – OAK – #184. Tyler Barnette who went to Charlotte was drafted in the 9th round, but didn't make this list? The kid was the A10 Freshman of the Year. Thanks for the comment. The list above was simply Baseball America's top 200 draft prospects who opted to go to school instead of signing. But you can rest assured that Barnette will make my top Sophomores list.